Part of the new dashboard that Patreon has rolled out is the Exit Interview. When a patron discontinues his or her pledge, they are offered an exit interview. This gives them a chance to explain why they’re leaving. 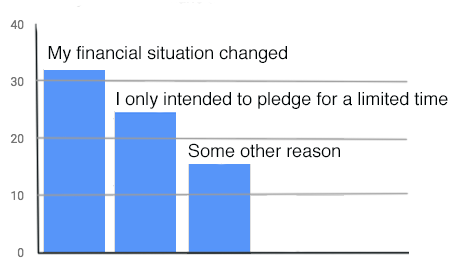 The second-most-popular answer: I only intended to pledge for a limited time. That backs up a philosophy we’ve discussed here in the past. Many Patreon backers do not view their pledge as a long-term commitment. That’s important to note as you’re developing your rewards. If you’re setting up rewards that pay out over a long period of time, you may be missing a significant portion of pledgers who don’t plan to stick with you for that long. So… the good news is this: You can stop beating yourself up over lost backers. Most of them have dropped out for reasons that have nothing to do with your content. And the others had a pre-determined time frame in mind when they joined. And your content did little to change that. Perhaps the most-offered advice on the Internet is “Don’t read the comments.” It’s simple, the perceived anonymity of the Web emboldens people to write things that they’d never say to another person’s face. It’s for that reason that I’ve posted several pieces (like this one) that try to help properly walk the balance between gauging reader feedback and being creatively paralyzed by it. The Feedback column in the Patreon Exit Interview has the potential to be just as frustrating as reader comments. I’ve noticed this on Kickstarter campaigns as well. The loudest, most belligerent complains come from the people who have contributed the smallest amounts. Take that for what it’s worth. Literally. But the more dangerous area, by far, lies in getting to emotionally invested in these comments. I found myself obsessing over comments like this one from a $10 backer: “I didn’t anticipate 60% fewer comics.” I found myself debating with this faceless patron for the next several days — wondering if s/he had ever supported anything I had done other than the NSFW comics offered at the $10 level. After all, one of the main reasons I scaled back on the daily comic strip was that the response to the adult comics (including this patron’s own support) was so large. And, as a $10-level backer, this person was getting way more comics than I had created on a weekly basis before! In addition to the two strips, this person was getting a weekly full-page comic, bonus comics, Courting Disaster, and anything else I could throw at the feed! If anything, they were getting a sixty percent increase! The amount of brain space I devoted to that was — honestly? — depressing. Tell Brad Guigar thanks for his awesome work, and that I’ll be back next year for him. Loved my month, and I’ll be back after holidays are paid for. Keep up the great content. I’m hooked, but broke. But me, I couldn’t see those because I was too focused on the negative ones. Now, as I’ve said before, you can’t afford to disregard comments from Patreon backers completely. In fact, I’ve argued that their comments should be taken much more seriously than run-of-the-mill reader comments. So, do take some time to read and reflect on the comments you’re getting there. Just don’t let yourself get derailed.